During construction of a home the stucco exterior is installed prior to installation of concrete driveways, sidewalks, porches or steps. When this procedure is followed the stucco will be behind and below the concrete. If, at this time, the stucco is not finished and sealed correctly it will be in contact with the soil under the concrete. This condition can create an easy passage for termite infestation and insects. Rotting wood and/or termite infestation can be a result. 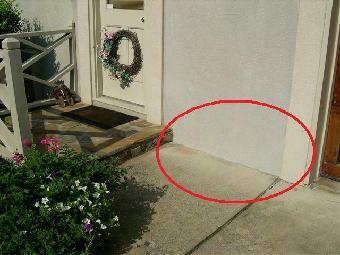 To prevent this problem we do a procedure called Stucco Cut Back, or Stucco Cut at Ground Level. We remove the stucco on a 45� angle, reseal and waterproof the bottom edge. Fiberglass mesh is installed and the area is skimmed and refinished. 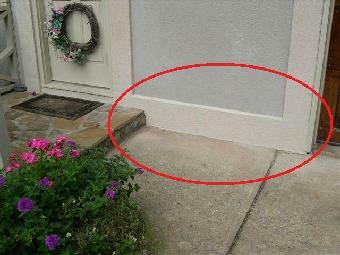 A decorative trim band can be installed in all areas where concrete, stone or brick contacts the stucco. This procedure complements the overall exterior design of your home. It gives a finished, well manicured look to the area which was repaired as shown in the pictures below. Stucco in contact with concrete, prior to a bottom cut.